The demand to “fashionize” doesn’t stop at anything, even a laptop bag. That’s why there are more and more cool or beautiful designs coming out. For men, as a timeless laptop bag, leather is a must try. It’s not only durable, but also even gets better with time. 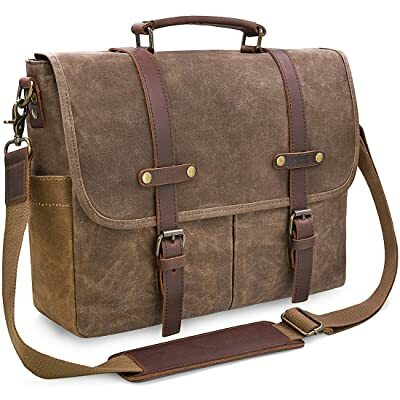 Finding a truly good leather laptop bag for men isn’t a hard task for a loose budget. However, on the contrary, if you have a tight one, this list below might give you some help. Take a look. 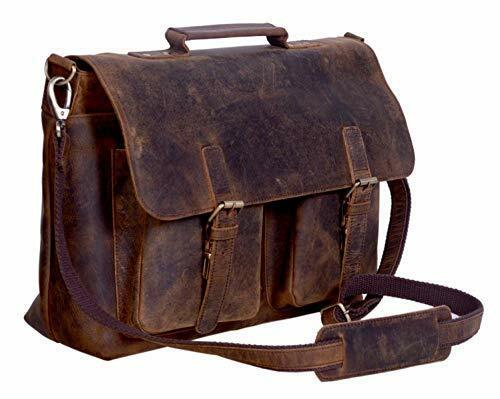 Start off this collection is an India-made leather laptop messenger bag from KomalC. If you’re looking for one that’s made of the finest hunter buffalo leather with high-quality canvas lining, this is really worth every single penny. It’s price might be a bit more expensive than other leather models, but in comparison to its super amazing durability, you won’t regret it. Beyond my expectation is its lightness, when empty, this bag just weighs around 3 lbs. Going inside, you will see a separate sleeve designed with a strap to keep a laptop/MacBook, another spacious compartment for your daily essentials, two smaller pockets, and plus, two outer ones. So, I think it’d be very perfect for daily office, school, travel, business and so on. The only thing that you should take note is its laptop sleeve somehow fits my 15” MacBook (without padding cover), but for other brands, it might be a little bit narrow and lack of space. A normal laptop sizing smaller 15” will be perfect inside this bag. 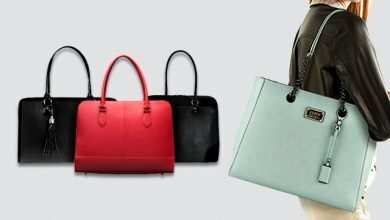 This feminine bag is my recommendation for those whose 15.6” laptop or smaller as there are two size options for you: the 14” and the 15.6”. Besides, are 7 different beautiful colors to choose from. 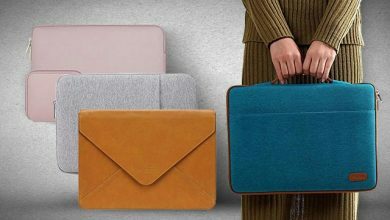 Featured as a small leather laptop bag, as well as it’s made out of 100% high-grade Pu leather, it’s freakily lightweight. Contrast to that, is a streamline and roomy interior, including 1 huge main compartment, 1 small zippered pocket, 1 sleeve with soft padding and a sturdy Velcro strap closure, and finally, 2 small slips. From that point, feel free to put in not only your precious laptop, but also note books, umbrella, smartphone, tablet, adapter, pens and stuff like that. Two biggest bonuses are firstly, its zipper closure plus a flap to keep this little lady shut absolutely closely when not in use and secondly, there’s no outdoor extra pocket to keep the whole bag’s silhouette supper flat and fashionable. With this one, thanks to its moderate cute yet professional outlook, you can utilize in many occasions, such as school, work, hang out, travel, interviews or casual use. Next is this DHK distressed leather laptop bag that I’ve been sticking with for 2 months day by day. And, have to admit that it works as a $600 bag. A lot of my colleagues left a compliment for its handsome outlook as well as its spacious, neat interior but all of them didn’t believe how affordable it is. Now ignore the measurement and focus on its leather material, that’s 100% genuine full-grain goat leather. Plus, it’s utterly handmade. So, there’s no strange when this laptop bag features a really nice brown-colored distressed but soft surface. However, when you choose a full-grain leather bag, it’s synonymous to spending some extra bucks for a bottle of specialized leather conditioner, especially if your living area has dry arid climate. My advice is getting an olive oil bottle and place the bag after conditioning under sunlight for a renew look. Otherwise, the leather texture will be obviously stiff with short lasting at the end. If you’re wondering about its waterproof ability, I would say this bag does repel off water drop or splash, but that’s not enough to assume it is waterproof. The well-made being isn’t shown just through its leather texture, but also the stitching. You can see it clearly in the wrap around its handle. It’s stitched closely and tightly that I’m utterly satisfied with its overall quality. In terms of size, this bag features 13 x 18 x 5 inches – perfect for a 17.3” laptop with padding cover or iPad. Aside from a separate sleeve for your laptop, there are other 7 slots for other essentials. Particularly, is a zippered inner pouch for coins, keys or other stuff like that. 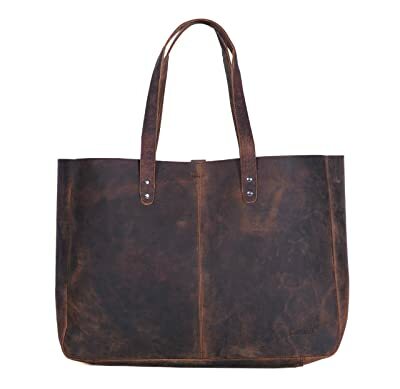 Like the DHK’s, this Komalc leather tote laptop bag is sophisticatedly handcrafted from soft, distressed buffalo leather. 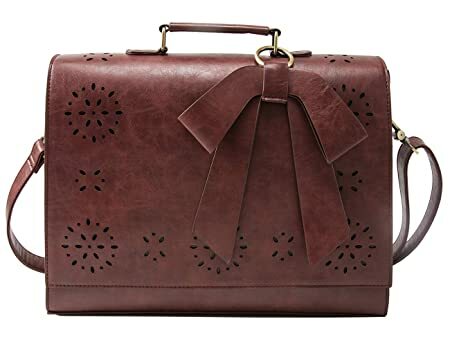 It’s a perfect choice for those ladies who are finding a vintage, wild style bag for work with minimal construction to boast your characteristics. Two size options to opt for: the 15” and the 18.5”. Both of them feature a roomy storage space for a laptop, umbrella, portable textbooks, A4 paperwork, wallet, smartphone, iPad and so on. 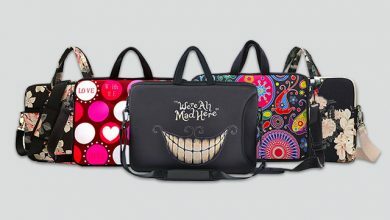 Besides, this bag is a perfect choice for those who love storing everything in one place as there’s just one main compartment inside featuring a 4” flat bottom and sides. 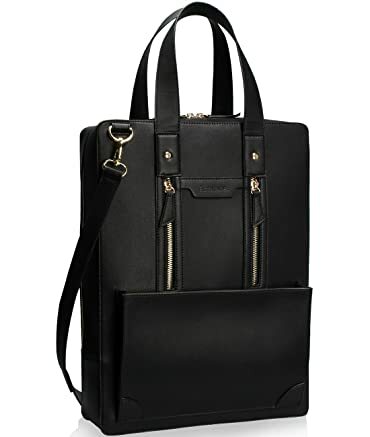 But take note that there’s no flap-over part or a full-length zipper to keep the whole bag shut closely, but just two snap button straps: one for the smaller inner pocket and the another for the whole laptop bag. In turns, if the inner untreated leather is your concern, keep ease in mind as the color won’t be transferred to your essentials. I even tried to place a cold drink inside this, but there’s no matter like that at all. For a classy and professional laptop bag that fits nicely a 16” laptop/MacBook, I suggest this Samsonite luggage briefcase. In the laptop world, Samsonite is considered as the king for not only its outstanding well-made stuff, but also variations in design and affordable price tag for a long-term investment. I’m here to prove that! Its quality is stated clearly through the material – Genuine leather with a lightly outer oil layer. I can’t ensure this bag is really waterproof, but it does enable to bear splash, and water drops. Many people don’t like slick stuff and me, too! However, I find this one doesn’t such that slickness. On the contrary, it matches nicely the minimal outlook with silver hardware and small brand logo embossing to deliver a whole classy, professional and mature look. Opposite to its simple outer performance is the well-organized construction with smart arrangement of dividers to give you enough places for everything but still assure an amazingly slim profile. That’s why it only enables to stand once you stuff it. 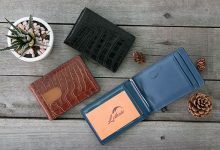 The highlight is its three card slots and pen slots (aside from a laptop sleeve and a zippered compartment) because it’s still possible to bring them along neatly without a wallet. Lastly, is a band to connect to your telescoping luggage handle. Pretty convenient for traveling, isn’t it? First off, it’s made out of superior crazy horse cowhide leather which is considered one of the most durable in the leather world. It can stand scratches as well as disordered wrinkles as well. But the point here is the extra water-repellant waxed canvas in the outside that if you live in New York like me or on anywhere else that often rains suddenly, this will be your best pal. In terms of the measurement, it’s roughly as thin silhouette as the Samsonite and by the way, also can fit a 15” laptop or smaller. However, about the construction, this one is considerably the winner as there are up to 9 pockets, including one long zippered compartment on the backside for your secret regular stuff. Not saying that its price is really cheap. So, combine with its wide, vintage look, that’s why I choose it as my go-to for a casual business look. Finally, is the convenient, comfortable shoulder strap as it’s detachable and adjustable with ease. 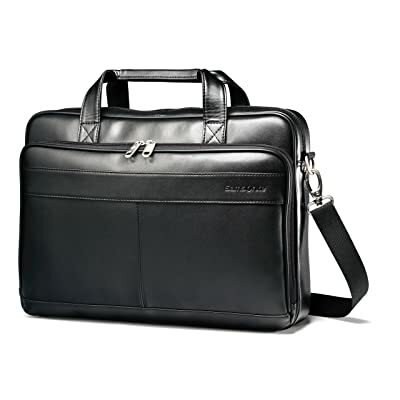 Estarer Business briefcase keeps an incredibly competitive price despite its superior quality. This bag sizes 12″*3.5″*16″ and it’s a perfect match for 15.6” laptop or smaller. Other that that, its storage space still allows you to put in some other daily stuff such as cables, documents, A4 folder, accessories, makeup, wallet, umbrella and so on. 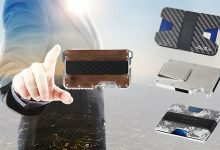 Particularly, you’ve got some buckle closed separated slots on the frontside which is the best option for pens, glasses, earphone for quick access. But keep in mind not putting important goods there. Based on such huge capacity, if your concern is about either the durability of this laptop bag or its neatness, then ease in mind. Aside from the high-quality material, its stitching is very tight and strong. 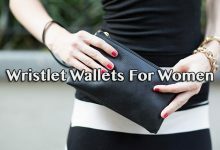 Plus, either the interior or exterior is well-organized with many different-size pockets. There’s just one minor drawback is right when unboxing the bag, its PU leather might be smelly a little bit. Just leave it for half of a day, it will be gone. About the material itself, as it’s Pu leather so the weight is much lighter whilst it’s low-maintenance to be a good choice for many occasions, like travel, office, business, or casual. Thumb up! 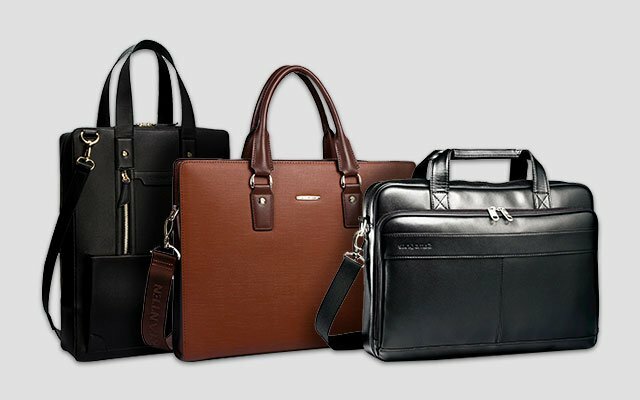 My pick for the best unisex leather lawyer laptop briefcase. It’s really slim in silhouette, but streamline enough to keep your daily essentials in place for easy access. Fit perfectly a 14” laptop and smaller, small charger, iPad, pens, paper document, smartphone and other business things. There are 1 main inner compartment, 1 laptop sleeve, 1 zippered pocket, 2 pen pockets, and 2 smaller ones. 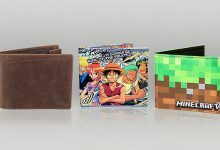 Besides, it has two sizes to choose from: The Medium and the Large with 4 different color options. 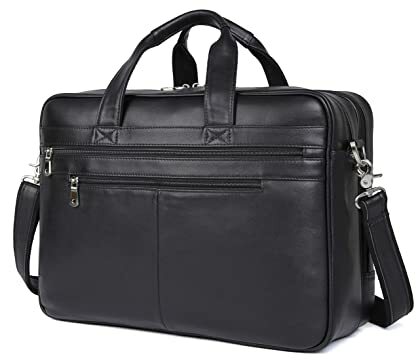 In terms of the price, it’s roughly $90 which I find it’s very well-worth for a business laptop bag, or lawyer briefcase due to its classy, mature and professional look as well as quality. This bag is very well-made – 100% handcrafted from the high-quality genuine cow leather with long-lasting fabric lining and custom hardware. If your laptop is 13” or smaller, this will be the perfect size. There’s not only a sleeve under flap for it, but also some wiggle room for comfort as well. 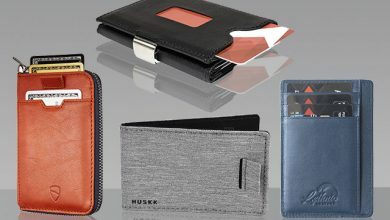 Other than that, is a vertical zippered pocket, a huge main section with side pockets, a full-length zippered compartment, a separate holder for cellphone, pen and cards. Plus, a rear zippered pocket for extra storage space. 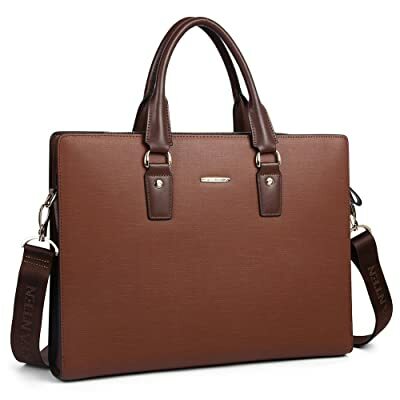 The biggest bonus of this laptop bag from Visconti might lie in its slim silhouette – 13.3-inch x 9.8-inch x 1.2-inch – very compact with a soft, comfortable shoulder strap to carry in many occasions, such as travel, school, university, hanging out, work, and casual. 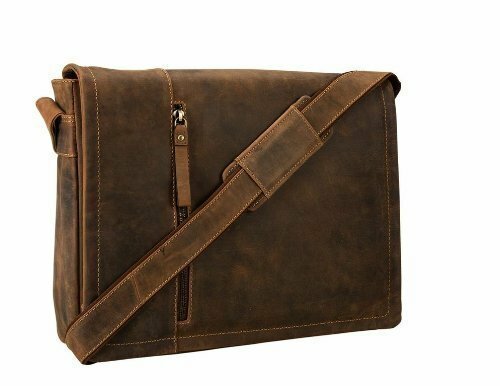 Differ from other leather laptop bags in this list, this one comes up with a very smooth oiled genuine leather with contrast stitching, its distressed surface is very impressive and characteristic. So, I bet many people who are leather addicts might fall for this one. There are three color options to choose from: black, brown and tan. All of them are handsome, but my most favorite is the tan because I’m not a fan of royal blue fabric lining. Last up, is the most expensive laptop bag in this collection. But why it’s expensive? First off, it’s crafted from the precious genuine Nappa leather inspired by many Italian designers. So, you can guess the rest – not only the leather texture is incredibly soft, smooth and sophisticatedly treated, but also quality of the whole bag is speechless. From the hardware parts to the stitching, it’s very durable, strong and long-lasting that you can feel ease in mind of a statement timeless piece in your closet. Besides, is the well-made laptop padding. A lot of laptop bags out there don’t pay much attention to this small but essential detail, which usually ends up with your laptop getting damage under impact despite already staying in your bag, such drops, bumps, collisions. But this isn’t the one! Other than that, is a perfect compromise of huge capacity, slim silhouette, and streamline organization. And now, is the most important feature of this luxurious bag, the 1-year warranty. It will be backed for any manufacturing faults by giving you either a full refund or a replacement due to your preference. So, you can by it with more confidence. 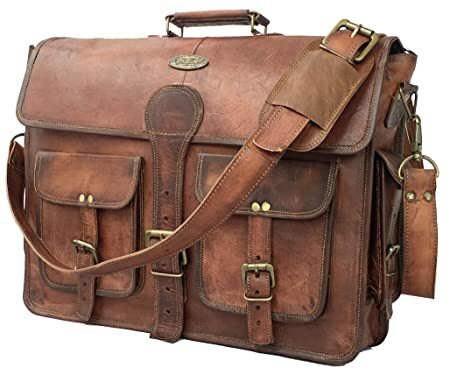 I have just shared with you some good options in leather laptop bags for men. One thing that I want to notice you is if your pick a genuine leather one, remember to take care of the material periodically for the best performance. It’s no need of too many things, just a cleanser specialized for leather and clean cloth. 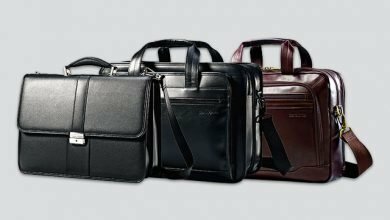 I hope that this article helps you find out the best leather laptop bags for you, both in preference and budget. Thanks for reading!